I don’t know about other moms but I seem to have a hard time finding things to do all day with my toddler. Usually we end up watching one Blues Clues show, going on a walk if it is warm enough and then spending the rest of the day playing with her toys. I know this routine is more than ok with my daughter but for my sanity I knew I had to switch it up a bit so I went searching online, through magazines and through the app store on my phone for some ideas. I did end up finding a really cool app called Koala from the Apple app store and it goes through a TON of toddler activities that other moms have added to the app that have worked with their toddlers. The other day I decided it was time to try some new activities with Savannah so I opened the app and found some great ones and since I know not all moms have access to an app store I thought I would share 10 of those toddler activities that worked for my daughter who is 15 months. I thought of this idea because we had some bubble wrap just lying on the table from a package that we had received recently. 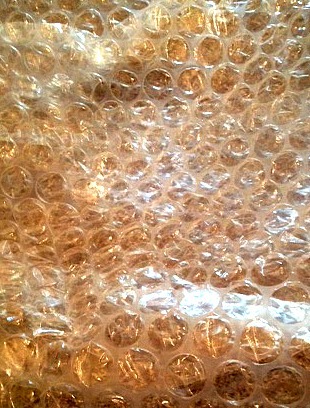 Since I had no intention of using it any time soon I decided I would show Savannah what bubble wrap was all about. I called her over and took the bubble wrap in my fingers and started to pop a few of the bubbles and she thought it was very funny. She of course wanted to try it too but she is still a bit too little so she wasn’t strong enough to pop any of them, but she enjoyed watching me pop the bubbles for about 5 minutes. Something else you could do with bubble wrap is to let your child walk on it, this works best if they are wearing shoes and it is placed down on a hard surface like tile or hardwood floors. Then everyone lets go and falls to the ground, gently though. This one is always fun, even for me! All that is needed for this is three chairs, a sheet and some books or clips. This last time that I set up a fort for Savannah I made it a different way, with clips (the black ones that you can get at office supply stores). I draped the sheet over the chairs and then clipped the sheet to each one. Super simple and provides so much time for play and imagination. 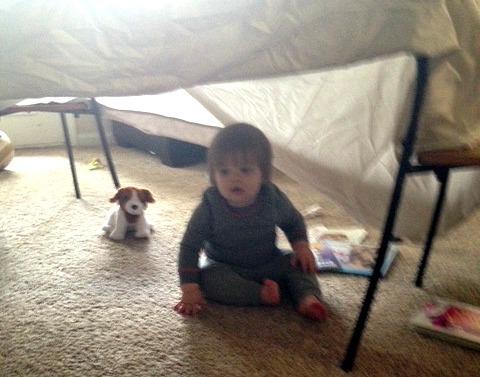 In our fort Savannah and I read books, we have also used forts to play peek a boo and just run in and out of it. Sounds a little silly to “start a band” with your toddler but this activity is one that Savannah LOVED! 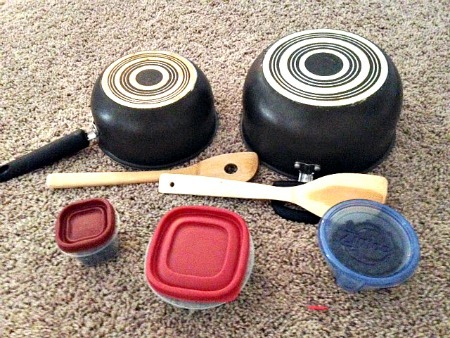 I grabbed two pots from the kitchen along with two wooden spoons to make the drums. I then grabbed three small plastic containers and filled them halfway each with some black beans, raw and dry, from the pantry to make maracas. I liked this activity because it let Savannah be creative and explore new sounds. I didn’t even mind the splitting head ache that I got from the pot banging… Besides the headache this was very good and I even left the containers as they were, I have a ton of small ones I have never had to use them all at once, so now she will find one on the floor and pick it up and start shaking it! I love that she loves music and this was a great way for her to learn new ways of making music. All you need for this is music and some room to move around! I like to turn on Pandora and either turn on the Barney station, Disney or Kesha (for some reason she loves to dance to Kesha!). After the music is selected and turned up high, but not too high especially if you are in an apartment and have neighbors, you wiggle all around to the music! Just go wild and encourage your child to do the same, once they see you doing it they most likely won’t have a problem joining in. This one is like the carnival game where the person running it hides an object under one of three cups and then moves them around and you have to guess which one the object is under. For my toddler version I grabbed one of her small plastic balls, like one from those hammer toys where you hammer the balls through a hole and they go down a slide, and three bowls that you cannot see through. 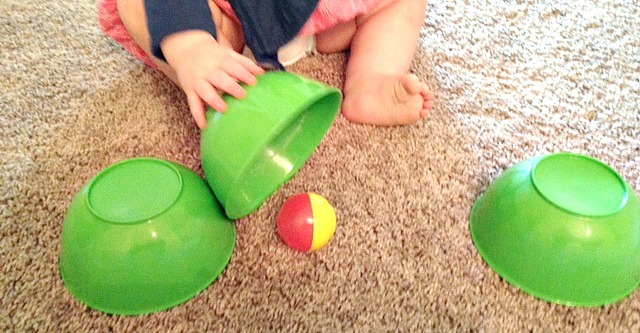 At first you might want to start with just two bowls to let your toddler get a good understanding of the game. Place the two bowls in front of you and then pick up one of them and show them that you are putting the ball underneath it. Then switch the positions of the two bowls a couple of times and ask them “where is the ball?” and encourage them to pick up one of the bowls and make sure to applaud when they find the ball whether it was their first or second try turning over a bowl. When you think your toddler has gotten the hang of it than try and make it a little more difficult and add another bowl. This can also be played with your hands and a small object like a gold fish. Hide it in one of your hands behind your back and have them guess which hand it is in, Savannah loves this game especially during church! All that is needed for this activity is a deep container and ice. 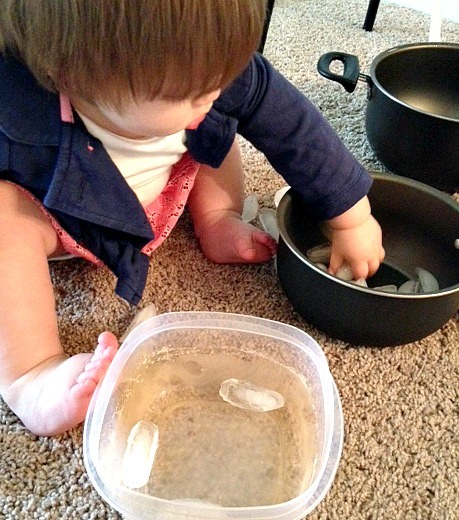 Put the ice in the container and give the container to your toddler and let them explore. I had left the pots out from before and Savannah took the container over to one of them and started transferring the ice from the container to the pot and back and forth. 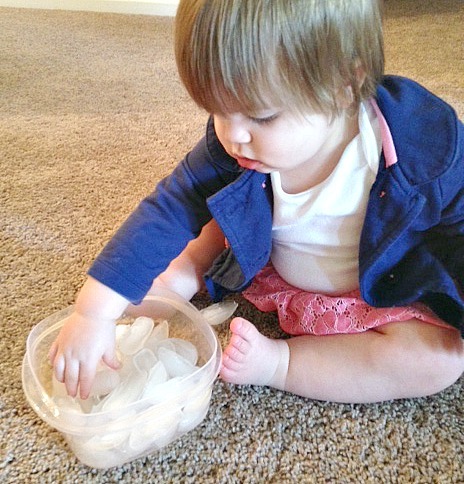 She loves ice so this was a fun activity for her to be able to sit and play with it. For this activity my daughter’s favorite part is to take out. This can be done anywhere that there is a container that holds things. The place we usually do this is in Savannah’s room with the toy chest, usually it ends up being me trying to clean her room and her deciding she wants to play with every item I am trying to put away. To get her to put away though I will give her an item and point to where it needs to go and ask her to please put it away and she will and this game goes on until I have handed her every individual thing from her room to put away. A long and tiresome activity sometimes but one that gets work done as well as a game and teaching her how to pick up. If you have a toddler most likely they are in love with their reflection and will stare at it for as long as possible. 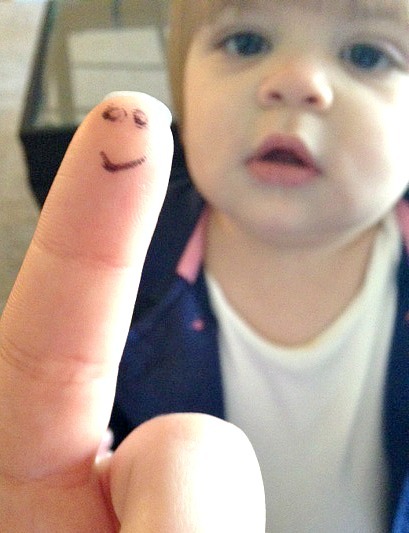 My daughter is like this. I took her into the guest bathroom and set her on the counter and automatically her face lit up as soon as she saw that cute little girl staring back at her. 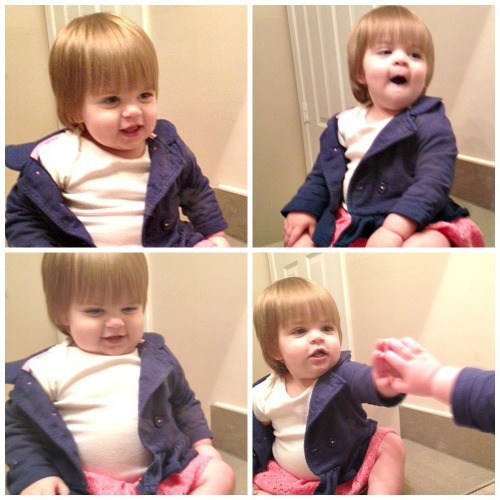 She touched the mirror, smiled, made faces and had a blast just being herself with this new baby to “play” with. There are the 10 toddler activities that my daughter and I enjoyed this past week! What are some of the activities that you enjoy doing with your toddler? Which of these 10 toddler activities are you going to try? I love this article, my daughter just turned a year old and this gives me some great ideas of some things we can do throughout the day. Thanks so much for this! 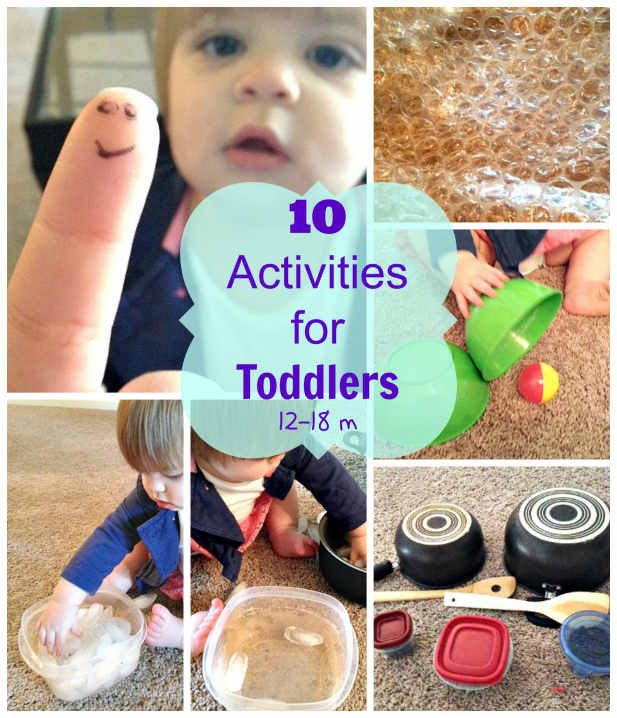 Most toddler activities listed are for older toddlers so this was very helpful!